Disney Junior's Sofia the First fans will love creating adventures in Sofia's Magical Carriage pulled by her flying horse, Minimus the Great. Have a woodland tea party with Whatnaught the squirrel near his revolving tree, then help Sofia find the magical book hidden in the secret library. Includes a LEGO® DUPLO® figure: Sofia, plus Minimus the Great and Whatnaught the squirrel. Last known price is 18% below the initial Lego retail price! 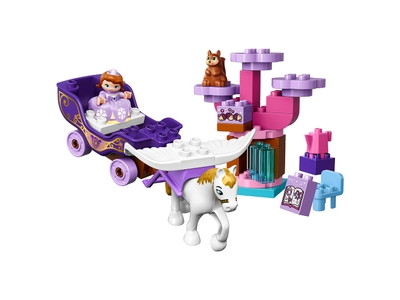 The Sofia the First Magical Carriage (10822) Lego set is no longer directly available from the sites below. However, 3rd party partners of these sites might still have the set available. Alternate description Travel in Sofia's Magical Carriage and let Minimus the flying horse take you on a royal adventure to the forest to find Whatnaught the squirrel in his revolving tree. Includes a LEGO® DUPLO® figure: Sofia, plus Minimus the Great and Whatnaught the squirrel. Features a buildable carriage with turning wheels, and a revolving tree. Accessory elements include a chair, teapot, bricks decorated as hazelnuts and a magic book as story starters. Encourage role-play skills with Sofia the First and her magical flying horse Minimus. Young children will love to visit Whatnaught in his revolving tree in the forest and find the magic book. Help your child masterbasic construction skills by building and rebuilding this simple model. Sofia's Carriage with Minimus the Great measures over 3” (9cm) high, 10” (26cm) long and 4” (11cm) wide. Tree measures over 6” (16cm) high, 5” (15cm) wide and 3” (8cm) deep.